Interested in becoming an Affiliated Society? Learn more here. HGSCEA was well represented at CAA by members who presented papers and chaired sessions, and whose latest publications could be found in the book exhibition. Of particular note was our sponsored session, “Women Artists in Germany, Scandinavia, and Central Europe, 1880-1950,” chaired by Kerry Greaves. Her introductory remarks and concluding comments framed four excellent papers by Emil Leth Meilvang on Rita Kernn-Larsen, Nora Butkovich on women in the Young Yiddish Group in Poland, Lauren Hanson on Mary Bauermeister, and Lynette Roth on Anneliese Hager. On the conference’s last day, Paul Stirton offered members a special tour of the exhibition “Jan Tschichold and the New Typography,” which he curated at Bard Graduate Center. Over sixty members, many in metallic attire for the Bauhaus centenary, attended the annual dinner. In the course of the convivial evening, the results of the 2018 Emerging Scholars Prize were announced. Anne Reimers (University of the Creative Arts Rochester, UK) received an honorable mention for “Inscribing Temporality, Containing Fashion: Otto Dix’s Portrait of the Dancer Anita Berber Contextualized,” in Art History. The winner was Greg Bryda (Barnard College), who was awarded the prize for “The Exuding Wood of the Cross at Isenheim,” in The Art Bulletin. In addition, we celebrated the achievements of Maria Makela on the occasion of her retirement. Adrian Sudhalter spoke to the impact of Maria’s scholarship, and Ricki Washton-Long reflected on her important contributions to HGSCEA. NCAA welcomes three new board members, Jonathan Fohrman, MiraCosta College, CA, Sarah Meyer, California Poly Pomona, and Michael Wille, Illinois State University to the NCAA Board of Directors. The next NCAA conference will be hosted by Kate Bonansingakn, University of Cincinnati, Matt Albritton, Northern Kentucky University and Paige Williams, Art Academy of Cincinnati. We hope to see everyone in Cincinnati September 17-22,2019! Check it out on our website. 15th Annual Award Luncheon honoring cultural anthropologist, author and museum director Johnnetta Betsch Cole, Ph.D., and visual artist Mickalene Thomas, whose work of African American women examine, extend, and subvert concepts of female identity and beauty.Dr. Cole and Ms. Thomas will be presented with the 2019 Award for Excellence in the Arts on Wednesday, April 17, 2019 at the New York Athletic Club. For tickets and sponsorship opportunities please click here. Or by calling 212-889-5404 x11. Prof. Damiano Acciarino, Univerisità Ca’ Foscari Venezia and University of Toronto, who holds A Marie Curie Global Fellowship (2017-2020) was the first recipient of ATSAH award for his innovative and scholarly research on Renaissance antiquarianism published in Lettere sulle Grotteche (Rome: Aracne, 2018). William Levin contributes a second award to SECAC for scholarly Research in the History of Art Since 1750. The previous award was for Research in the History of Art Before 1750. Sara Nair James. “Wit and Humor in Ugolino di Prete Ilario’s Life of the Virgin at Orvieto,” Source: Notes in the History of Art vol 36, no.3-4 (Spring/Summer 2017), 159-67. Davide Lacagnina, “Spreading Visual Culture: revues, images et archives pour l’art contemporain,” In H.V. E. Stead, ed L’Europe des revues II (1860-1930). Réseaux et circulations des modèles (PARIS: PUPS-Presses de l’université Paris-Sorbonne, 2018), pp. 829-852. Émilie Passignat, “‘Manière’, ‘maniéré’, ‘maniériste’: transferts et enjeux théoriques autour d’un terme clé du vocabulaire artistique”, in M.-C. Heck, M. Freyssinet, S. Trouvé (eds. ), Lexicographie artis- tique: formes, usages et enjeux dans l’Europe moderne, Montpellier, 2018, pp. 363-376. Liana De Girolami Cheney, “Edward Burne-Jones’s The Mirror of Venus: Physical and Intangible Female Beauty,” Journal of Literature and Art Studies, Vol. 19, No. 1 (January 2019):1-28. We are proud to announce that we have launched a new name, look, and message for AIC and FAIC! The American Institute for Conservation of Historic and Artistic Works is now simply the American Institute for Conservation. The foundation is now the Foundation for Advancement in Conservation. The acronyms are the same, but our message is more direct: we preserve and protect cultural heritage. We’re reinforcing this message with a new online presence: www.culturalheritage.org. AIC President Margaret Holben Ellis explains the necessity of our new identity in this video. We welcome you to explore our new online presence and let us know what you think. You can provide feedback via email to info@culturalheritage.org. Throughout this process, we considered how we could make our field more welcoming and engaging to all practitioners in the arts, humanities, and allied professions. We would like to invite everyone to learn more about conservation and support the essential work performed by conservators and preservation professionals. 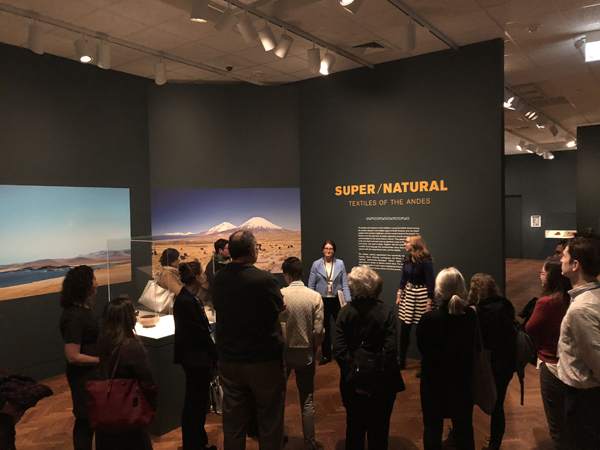 Friends of Conservation receive exclusive insights into conservation while sustaining programs that promote the preservation of cultural heritage through their gift to FAIC. Learn about the benefits of being a Friend and how you can help support the work of conservators here: www.culturalheritage.org/friends. Women’s Caucus for Art invites submissions for a panel to be held at the CAA conference in Chicago. WCA hosts a conference concurrent with CAA, with some panels happening on site at CAA, and our 2020 theme is Intersectionality. Sessions are 90 minutes and may take the form of panels or roundtable discussions. We welcome submissions of topics for an open call as well as submissions with panel participants already identified. Proposals are due April 21, 2019. Selections will be made by the WCA Executive Board and the Conference Committee. Applicants will be notified of decisions by April 28, 2019. The new Digital Art History Society (DAHS), launched on January 1, 2019, inspired by “Art History in Digital Dimensions,” hosted in October 2016 by the Department of Art History and Archaeology and the Maryland Institute for Technology in the Humanities (MITH), University of Maryland, College Park, with support from the Getty Foundation and the Samuel H. Kress Foundation (see: http://dah-dimensions.org/). The Digital Art History Society (DAHS) supports art historical scholarship incorporating and benefitting from digital strategies and technologies. Its website (https://digitalarthistorysociety.org) and listserv promote communication about resources and opportunities for its members. Membership in 2019 is free; dues will subsequently increase to $25.00 to defray administrative costs. DAHS presented “Constructing Criticality in Digital Art History,” at CAA’s 2019 meeting (https://caa.confex.com/caa/2019/meetingapp.cgi/Session/2249.) Its 2020 session will examine new scholarship enabled by digital techniques and strategies. DAHS looks forward to collaborating with other CAA Affiliates. Founding Board: President, Anne Collins Goodyear; Vice President for Programming: Pamela Fletcher; Vice Presidents for Outreach: Deena Engel and Charles R. Johnson; Vice Presidents for Membership: Meredith Gill and Paul Jaskot; Vice Presidents for Communications: Jennifer Henel and Ellen Prokop; Treasurer: Anne Helmreich. Lecture: “Artist Archives Initiative: New Research Models for Contemporary Artists,” Thursday, May 2, 4:00 p.m. to 6:00 p.m. The Frick Collection and Frick Art Reference Library, New York. Deena Engel, Clinical Professor, Computer Science, NYU, and Glenn Wharton, Clinical Professor, Museum Studies, NYU. Workshop: “The Lenox Library Picture Gallery: A Digital Recreation,” Wednesday, June 5, 4:00 p.m. to 6:00 p.m. The Frick Collection and Frick Art Reference Library, New York. Sally Webster, Professor Emerita, Lehman College and the Graduate Center, CUNY, and David Schwittek. 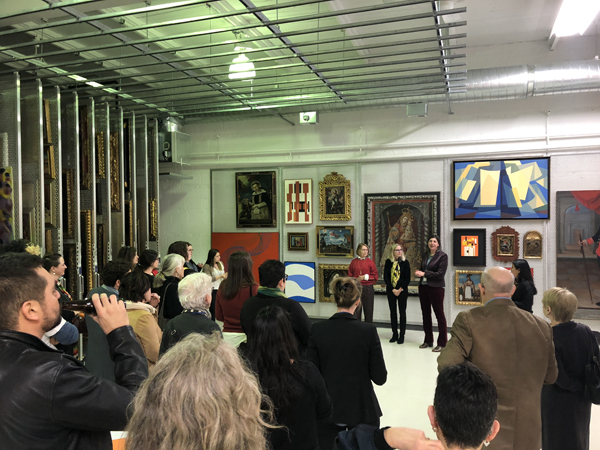 The Midwest Art History Society (MAHS) recently concluded its annual conference in Cincinnati where participants were warmly welcomed by local institutions — especially the Cincinnati Museum of Art (CAM) and the Taft Museum of Art which both hosted scholarly sessions. The keynote lecture was delivered by S. Hollis Clayson, Bergen Evans Professor in the Humanities at Northwestern University, in association with CAM’s exhibition Paris 1900: City of Entertainment featuring works drawn from the collections of the City of Paris museums. At the annual business meeting, Erica Warren, Art Institute of Chicago, was elected the organization’s treasurer. Plans are well underway for the 2020 annual conference which will be held in Houston, March 19-21. The call for papers will be posted on the MAHS website in the fall and hotel rooms can already be reserved at the Magnolia Hotel Houston. For more information, please visit the website at www.mahsonline.org. SECAC 2019, Chattanooga, TN, October 16-19: The 75th annual SECAC Conference will take place in Chattanooga, Tennessee, October 16-19. The conference will include more than 130 sessions exploring topics of scholarly importance and timely cultural issues impacting the fields of art history, art education, graphic design, and studio art. SECAC 2019 will examine the place of the institution amongst current political turmoil, explore studio and art historical research related to parenthood, develop strategies for supporting each other, and unpack how designers engage with their communities, amongst dozens of other topics. The Chattanoogan will serve as the conference hotel and hub, located in the heart of downtown and steps away from many cafes, restaurants, and attractions. Beyond conference sessions, opportunities to come together and experience the city will include a keynote address by Sharon Louden, visual artist and Artistic Director of Chautauqua Institution’s Visual Arts Program, at the Hunter Museum of American Art and the SECAC Juried Members and Artist Fellowship exhibitions, juried by visual artist and curator Amelia Briggs and presented with Stove Works, a new residency program and exhibition space located in Chattanooga. See https://secacart.org/page/Chattanooga for more information. Levin Awards for Research in Art History: Inspired by the friendships, professional advancement, and opportunities for exchange of scholarly research that SECAC supports, William R. Levin has made a second major gift to SECAC. Beginning in 2019, SECAC will award two $5,000 research grants in art history each year. The original Levin Award (2014) will be designated for Research in the History of Art Before 1750 and the new Levin Award will be for Research in the History of Art Since 1750. In memoriam: SECAC mourns the passing of Past-President Charles (Randy) Mack. Mack joined SECAC in 1970 and played an active role in the organization for 35 years, serving twice as president (1975-76, 2003-05), as vice-president (2000-03), and as board member from 1984-90. He also co-edited the SECAC Review (1973-75) and chaired the Annual Conference (1976). In 1993, he received SECAC’s Award for Outstanding Exhibition and Catalogue of Historical Materials; in 1998, he was the recipient of the Annual Award for Scholarly Research and Publication; and in 2004, he received SECAC’s highest honor, the Award of Distinction. The board of the Society of Historians of Eastern European, Eurasian, and Russian Art and Architecture (SHERA) is pleased to announce the inauguration of the SHERA Graduate Student / Independent Scholar Research Grant. The grant of $500 will be awarded to one member for research and/or study toward the completion of a thesis, dissertation, or publication. The grant is intended to be used toward the cost of research travel or accommodations, the acquisition of image rights for publication, language study, and other related activities. For the 2019 competition, applications are limited to graduate students and scholars who do not hold a full-time position at an academic institution. Applicants must be SHERA members in good standing and must have membership in the organization for at least two consecutive years. For more information, see the notice here. The conference “Eclecticism at the Edges: Medieval Art and Architecture at the Crossroads of the Latin, Greek, and Slavic Cultural Spheres c.1300–c.1550,” of which SHERA was a sponsor, was held at Princeton University on April 5 and 6. The symposium, organized by Dr. Alice Isabella Sullivan, Ph.D. (University of Michigan) and Dr. Maria Alessia Rossi, Ph.D. (The Index of Medieval Art, Princeton University), is the first such initiative to explore, discuss, and focus on the art, architecture, and visual culture of regions of the Balkans and the Carpathians (c.1300-c.1550). The conference sought to raise issues of cultural contact, transmission, and appropriation of western medieval, byzantine, and Slavic artistic and cultural traditions in eastern European centers and consider how this heritage was deployed to shape notions of identity and visual rhetoric in these regions from the fourteenth through the sixteenth centuries. Dr. Jelena Erdeljan of the University of Belgrade delivered the keynote address. Donations may be made in Marshall Ward Mount’s memory to the African Wildlife Fund. To contribute to the Christopher D. Roy Memorial Fund, go to //www.givetoiowa.org/2019la98. This fund will give UI art history students the opportunity to gain valuable intern experience at the Stanley Museum of Art.